On Sunday, 26 October, the Defense Entrepreneurs Forum hosted an innovation competition sponsored by the United States Naval Institute. $5,000 in prizes were awarded after the eight contestants made their pitches. This was the one-pager from the winning entry. In many cases, the United States cannot airlift supplies into non-permissive conflict zones without a major military effort to take down Integrated Air Defense Systems (IADS). Even then, manned cargo aircraft are vulnerable to surface-to-air fire from small arms and MANPADs. These challenges became apparent during the recent siege of Yazidi civilians in Iraq. With a humanitarian catastrophe unfolding and pressure on the US to “do something”, the US reluctantly began kinetic strikes to facilitate airdrops. In Syria, meanwhile, up to 240,000 civilians have been besieged by the Assad regime, ISIS, and various militias. The international community has no way to alleviate this suffering without direct military intervention. The ability to deliver cargo through non-permissive airspace would give the US government more flexible policy options for addressing humanitarian crises, and could open up new options in A2/AD environments. Non-governmental organizations could also employ this capability to bypass logistic bottlenecks and deliver aid to inaccessible or widely distributed populations. The revolution in micro UAVs (unmanned aerial vehicles) opens up a new paradigm for cargo delivery. Instead of using one vulnerable airplane carrying a large amount of cargo, it is now possible to swarm cargo in small packets. Micro UAVs are difficult to detect, and no one aircraft is worth the price of a surface-to-air missile. Although these aircraft are extremely payload limited, they could deliver critical medical supplies like insulin or antibiotics, and in sufficient quantities they could move greater masses of food or other supplies (imagine an army of ants carrying away a picnic lunch). After an eye-opening research trip among Syrian refugees, I founded the Syria Airlift Project to explore technologies for delivering humanitarian aid through contested airspace. 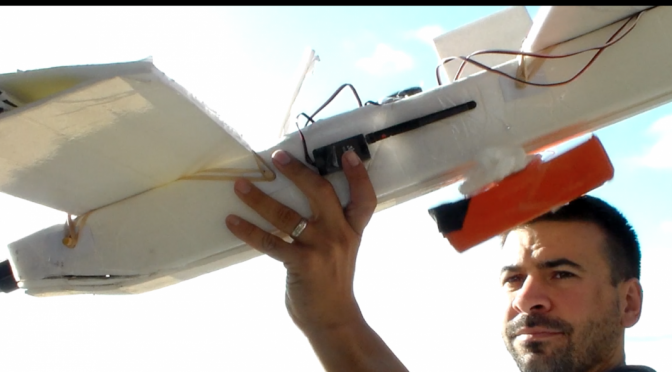 My team and I have developed a small fleet of experimental UAVs. Each vehicle costs less than $350 and can carry 2-3 lbs. We plan to iterate soon to a larger vehicle that can carry 5-10 lbs. The planes are built from common materials, and an experienced builder can assemble one in just a few hours. We are writing custom software so a single operator can generate a swarm of deconflicted flight plans based on a single reference flight plan. To ensure the technology does not fall into the hands of malicious actors, we are writing custom software and hardware failsafes that will destroy the autopilot in the event of a crash. We have successfully flown our aircraft on profiles including automatic takeoffs, airdrops at designated GPS coordinates, and auto landings. In the coming months, we will continue developing the ground station software and self-destruct mechanisms, building a larger aircraft, and extending our fleet’s range and endurance. We will also be developing our concept of operations for building, maintaining, and operating the aircraft. After extensive testing in the US, we hope to deploy a few trial aircraft with an NGO partner that serves northern Syria. I am also reporting on our work back to Air Mobility Command (AMC), the provider of global air mobility for the United States. Through my research, I have been able to build relationships with many key players in the micro-UAV industry. I am now on the volunteer developer team for 3D Robotics UAV autopilots and software, where I am focusing on improving flight safety, training, and the integration of private UAVs into the national airspace system. I am also working with AMC contacts on a concept for “standoff airdrop”, that would allow AMC aircraft to conduct airdrops at significant range from drop zones.